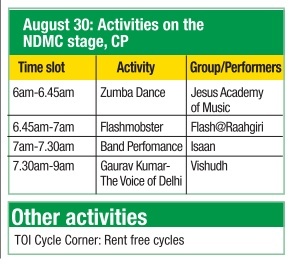 Start your Sunday with some good music at CP's Raahgiri Day. Groove to some funky beats at the Indie Fusion and World Percussion Fes tival by Djembefola United at the TOI stage. There will also be two band per formances by Isaan and Gaurav Kumar, the voice Delhi, by Vishudh. Those who just want a fun workout can learn some bhangra steps at the Bhangra Fusion session by Bhangrabics or work on their zumba moves at the zumba dance session by Jesus Academy of Music. Those who love flashmobs can take part in the Flashmobster by Flash@Raahgiri. Nukkad naatak lovers can attend the street play on sanitization and hygiene by Modern School, Barakhamba. 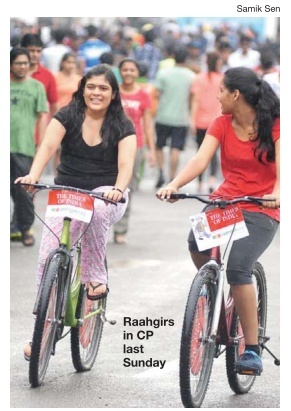 You can also take advantage of the traffic-free roads and rent a cycle for free from the TOI Cycle Corner.